My sister and I recently spent four weeks on the island of Nusa Lembongan for a yoga teacher training with Santosha Yoga Institute. 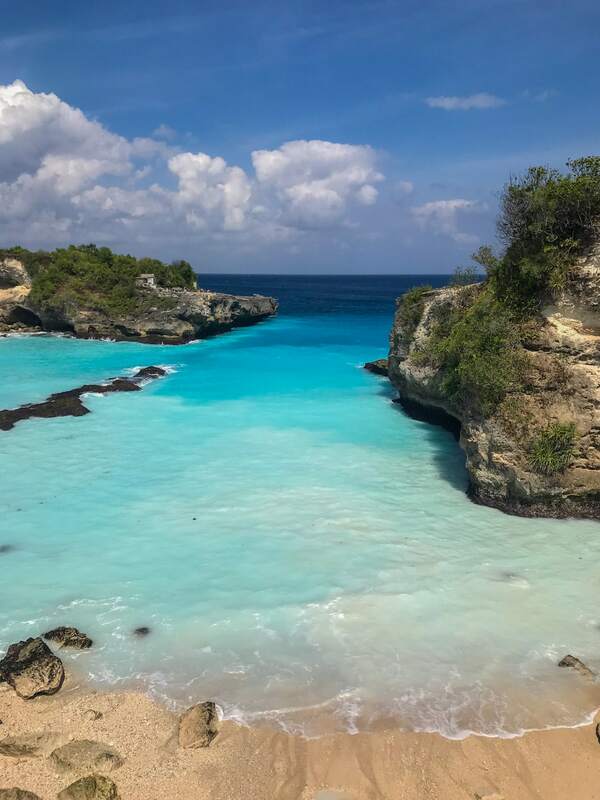 Although we had just a small taste, we loved the experience of “living” in Lembongan and wanted to share our experience just in case someone else gets the opportunity to visit this beautiful and unique place, too! Lembongan is a small, tropical island located about 30-minutes east of Bali. Lembongan and Bali are part of Indonesia, which is predominately a Muslim country. However, the majority of Bali (and Lembongan) follow the Hindu tradition making it a very popular destination to study and practice yoga. 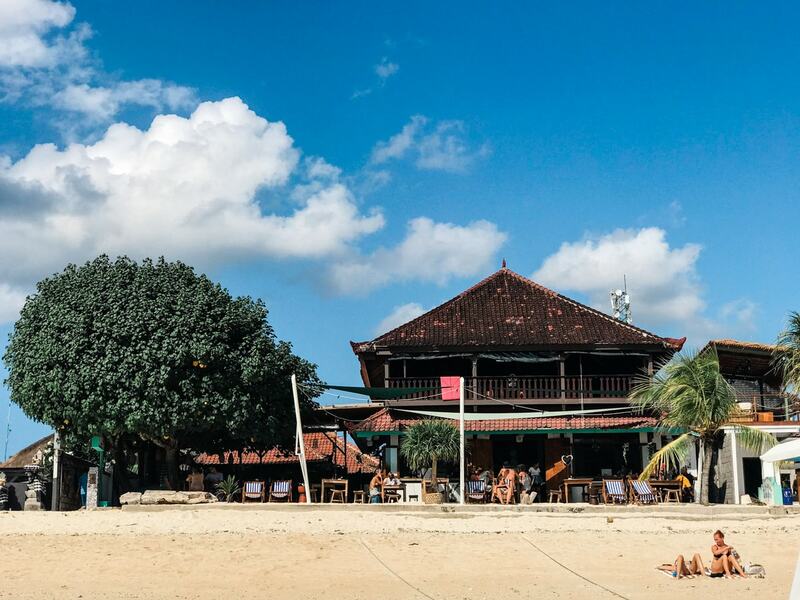 Like other tropical islands, Lembongan has a cool, laid-back island vibe. However, this was our first time in a predominately Hindu culture, which made the visit very different from any other place that we had traveled to before. To get to Nusa Lembongan, we flew into Denpasar International Airport on the main island of Bali. 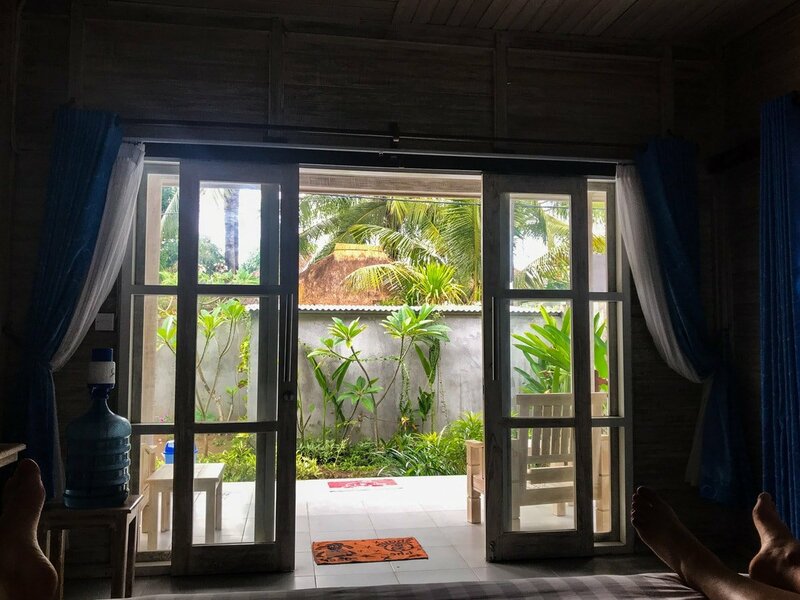 As we had traveled about 18 hours to get there from the US, we decided to rest a night at an Airbnb in nearby Sanur before heading over. 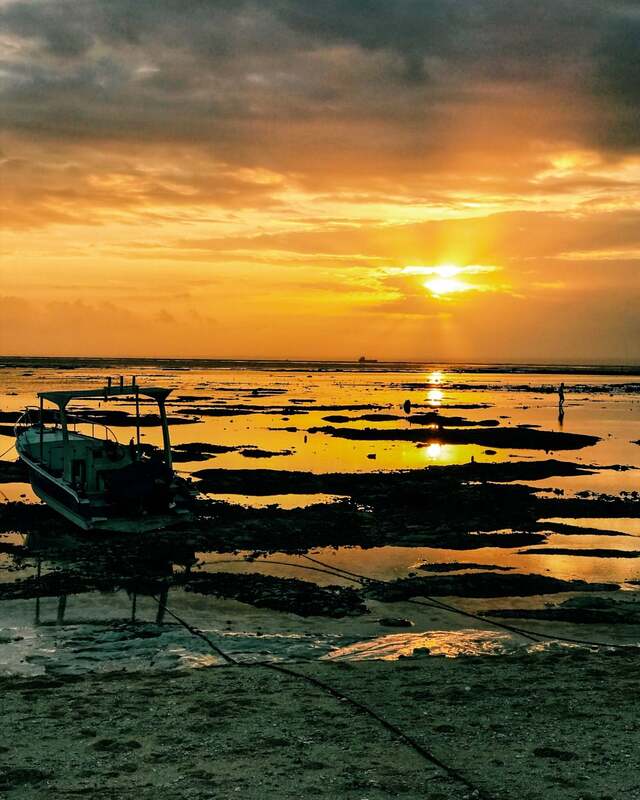 From Sanur, we took a fast ferry which was about a 30-minute ride to Lembongan. As much of our time in was spent in yoga teacher training, we opted to stay nearby at Vista Huts. It was one of the accommodations recommended by Santosha Yoga Institute, our teacher training, and it didn’t disappoint. Vista Huts, like many smaller accommodations on the island, was family owned and operated. It provided basic accommodations with basic amenities. We spent so much time in our training, at the beach, or exploring, that we barely spent any time at our villa. So, basic was all we really needed. 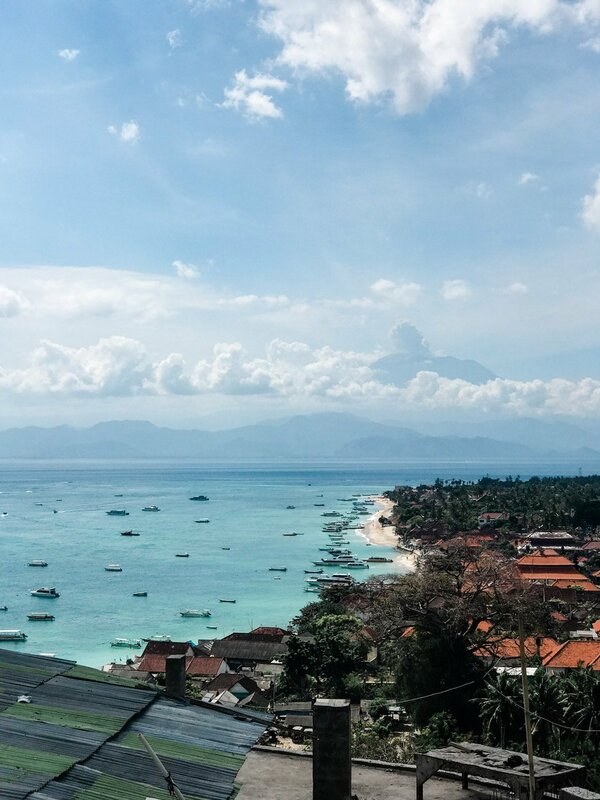 At Vista Huts, we were about a five-minute walk to the beach and our training at Yoga Village Lembongan. It was really close to little food markets on the main road and countless restaurants were within a 20-minute walk. Our stay included a basic breakfast of an omelet (or pancake), fruit, and Bali coffee every morning if we wanted to eat in. On a couple of our days off, we decided to step out of the “yoga bubble” that we were living in to check out different areas of the island. So, we ended up staying just one night each at two other locations. 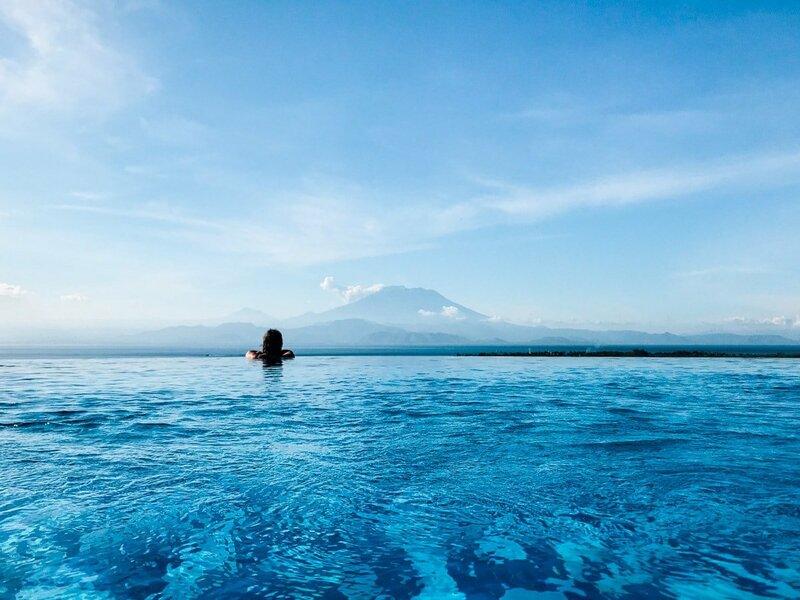 View of Mount Agung on Bali from the infinity pool at Jenggala. The other hotel we stayed at was Lembongan Beach Club & Resort on our very last night. It had good reviews and was nice, but was even more of a splurge than Jenggala and the atmosphere was a bit more touristy than we typically prefer. 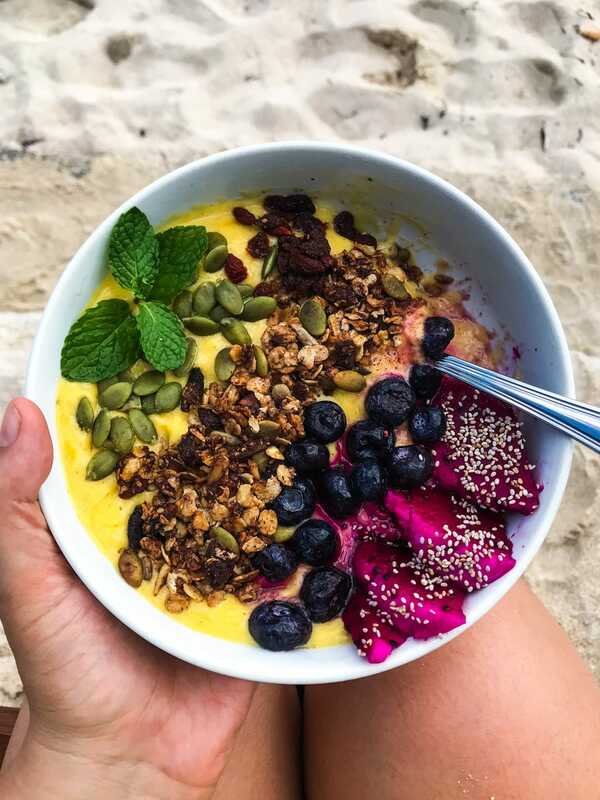 Before I share some of the yumminess, I will say the food that I ate while in Lembongan was not 100% low FODMAP. I’m in my adapted FODMAP phase. 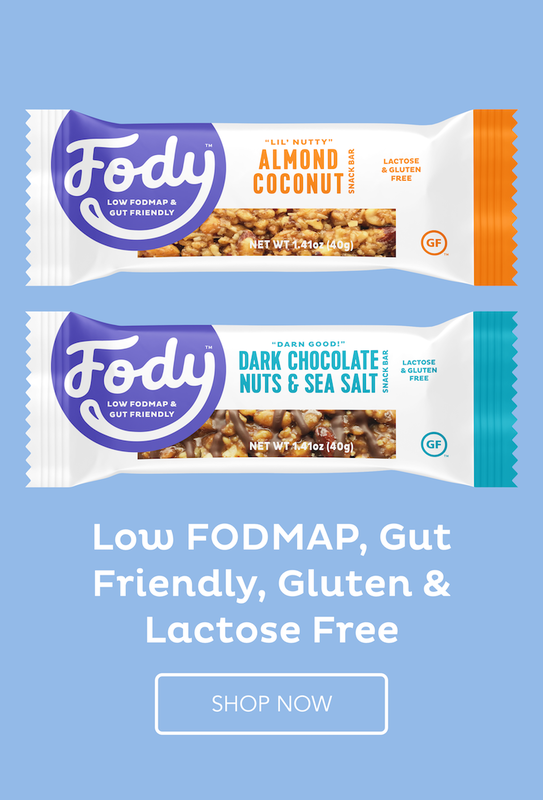 Overall, I stick to wheat- and dairy-free options, but try not to over-stress about most FODMAPs when eating out or traveling. I know this doesn’t work for everyone, but I love experiencing new foods especially while traveling. 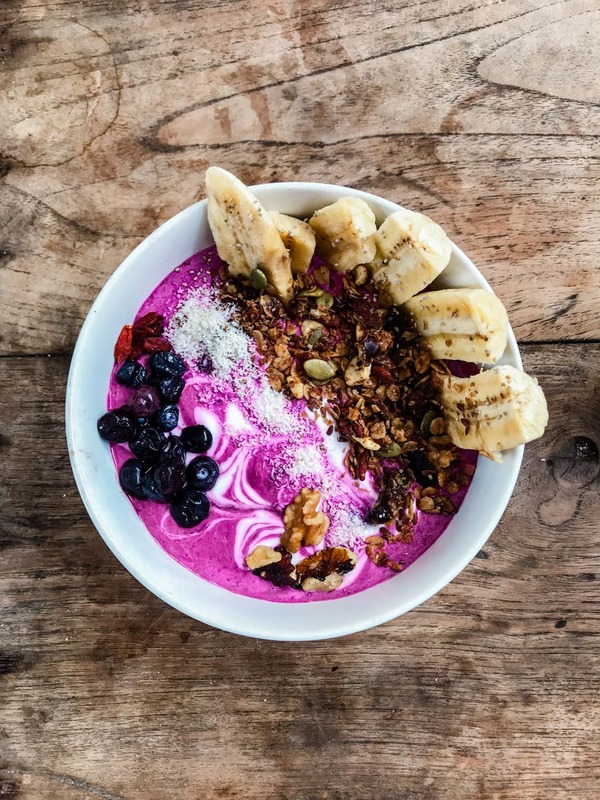 So, many times, I will consciously decide to try a new food or dish fully knowing I may experience some IBS symptoms after. Our yoga teacher training was situated above an awesome cafe right on the beachfront called Ginger and Jamu (pictured below). The cafe is operated by a former Santosha student and offers some phenomenal, mostly plant-based dishes. Due to the proximity to our training and the deliciousness of their food, we enjoyed many of our meals at Ginger and Jamu. 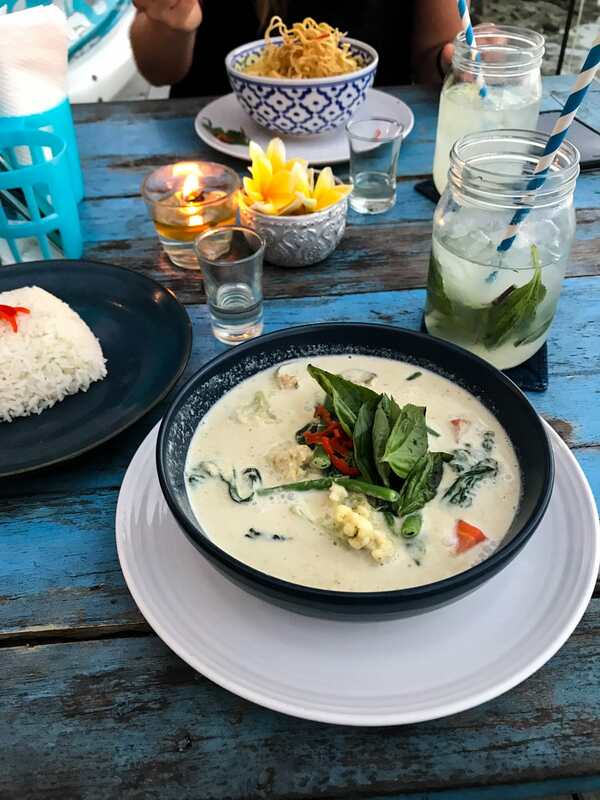 There definitely were more affordable options on the island, but Ginger & Jamu’s dishes (and coconut milk lattes) were hard to beat. We ate there often. 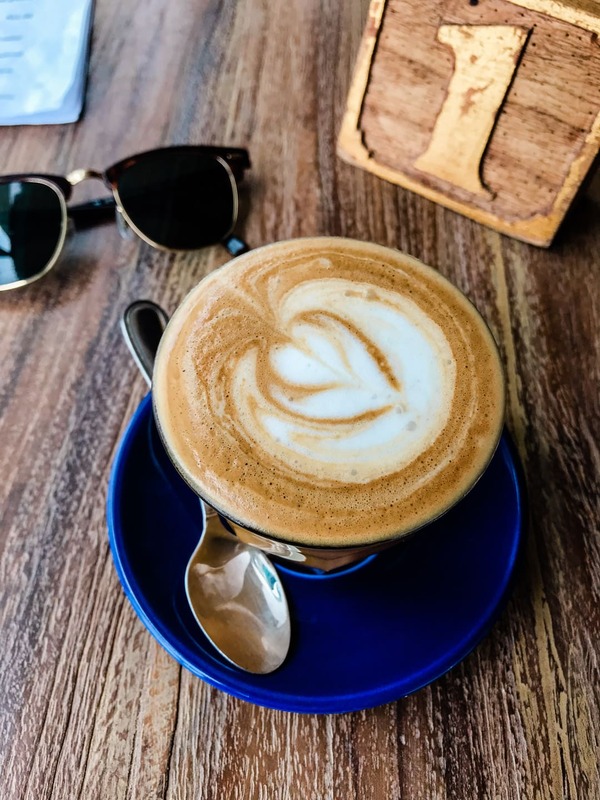 The BEST coconut milk lattes! This cool, sustainably-focused restaurant had really good WiFi and, more importantly, food. 🙂 The green curry was delicious, as were the vegan ice pops (especially the dragonfruit & pineapple and the chocolate & banana flavors). The ice pops were perfect for a light and refreshing snack in between classes. I may be slightly obsessed with Thai food, but the views from this open-air restaurant were super pretty at sunset and the food was yummy, too! It was about a 20-minute walk from Vista Huts, and totally worth it! I really liked the yellow curry, green curry, and Thai basil ginger lime squash (a fun non-alcoholic sparkling water drink). This super cute place has a cool vibe and serves up some yummy, GF-friendly foods. I tried a GF-friendly Nasi Goreng here, got my occasional french fry fix when my stomach was feeling off, and enjoyed their yummy, plant-based chia pudding often. We didn’t have a lot of free time off during our training but when we did, we tried to make the most of it. With the beach literally steps away, we usually brought our swimsuits and took a quick swim during our hour-long meal breaks. Staying so close at Vista Huts, we were even able to run back and rinse off before our next class. After yoga class at night, we usually had about an hour before sundown. 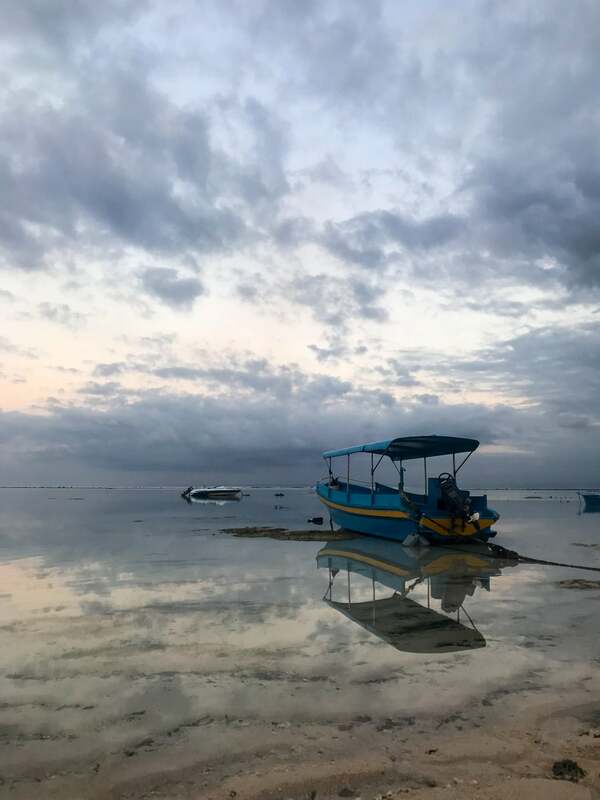 Most nights we would take sunset walks along the beach and help pick up plastic (which unfortunately is a problem in Lembongan/Bali) while we debriefed from the day. We would then eat supper somewhere and more often than not end up back at Ginger and Jamu for a ginger tea or bite of dark chocolate. On our full days off, we covered much of the island by foot. Although you can rent scooters, my sister and I really like to hike, so we opted to explore by foot. 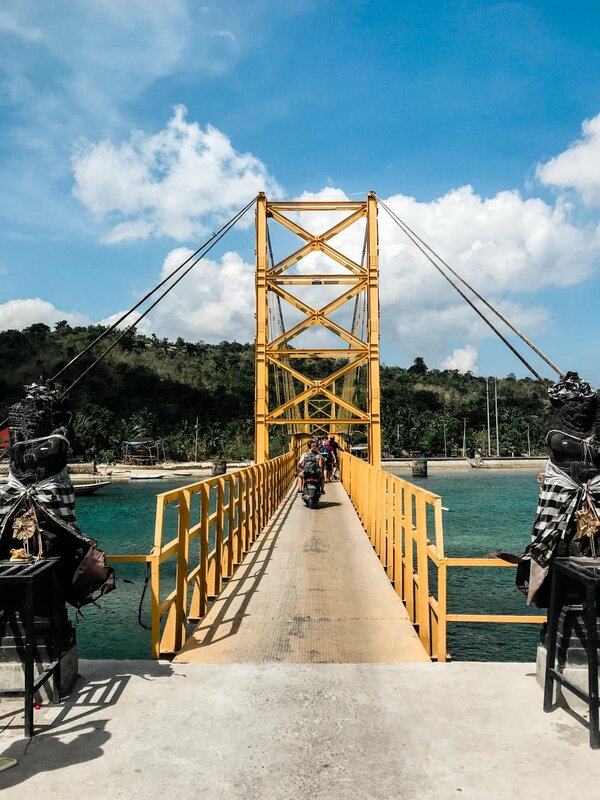 One day we even walked over to Nusa Ceningan and the famous yellow bridge connecting the two islands. On another day off we did a four-hour snorkeling tour which took us to nearby Nusa Penida to swim with manta rays. This experience was ridiculously cool and we highly recommended it if you ever get the chance. Cash is king and exchange money before you arrive on the island. 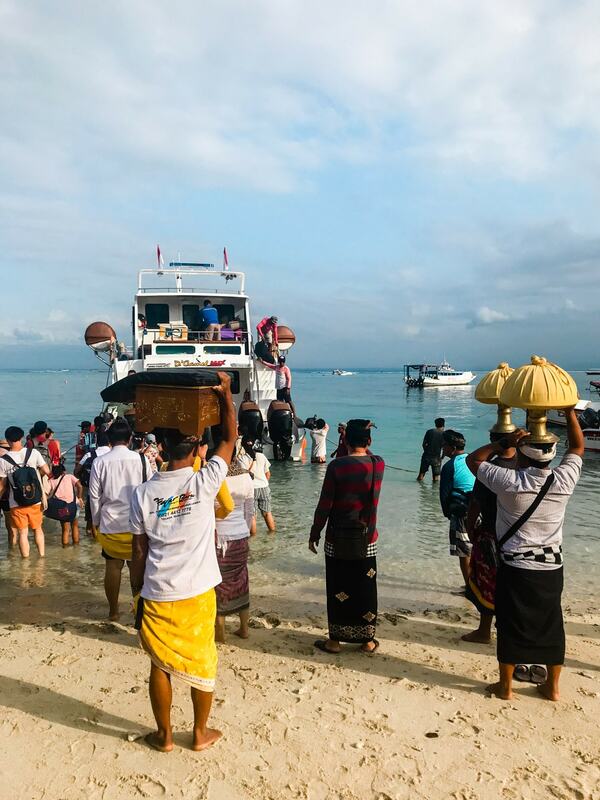 I prefer to use cash in my daily US life – it helps me stick to a budget – so I was prepared to use cash in Lembongan, regardless. We use Travelex (not sponsored), but some banks (not ours) will also order foreign currency for you. When we visited, there was one “official” ATM on the island and it was at least a 20-minute walk from where we were staying. Some restaurants, hotels, and shops seemed to accept cards, but not all. There is a lot of garbage on the island. Don’t get me wrong, Lembongan is beautiful in its own way. But, know that social media doesn’t always show the whole picture and you may be surprised by the amount of trash when you first arrive (like we were). 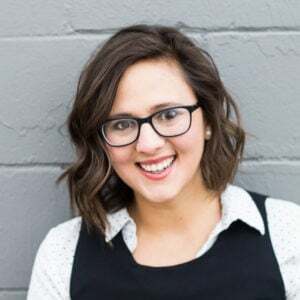 Although there are clean-up and eco-friendly initiatives in place, you will likely walk down an alley surrounded by trash or see plastic bottles strewn on the beach. We tried to help in our own small way by participating in beach clean-ups, as well as minimizing the amount of plastic we used while we were there. But, there is definitely more that can be done. Pack light. This is a principle I subscribe to regardless of where I travel. However, it could be even more important in Lembongan. While we were there, the tide would sometimes get super low and the fast boat ferries were unable to make it all the way to shore. Although it didn’t happen to us, some passengers were stuck carrying their luggage through a foot or so of water at low tide to get to and from the shore. 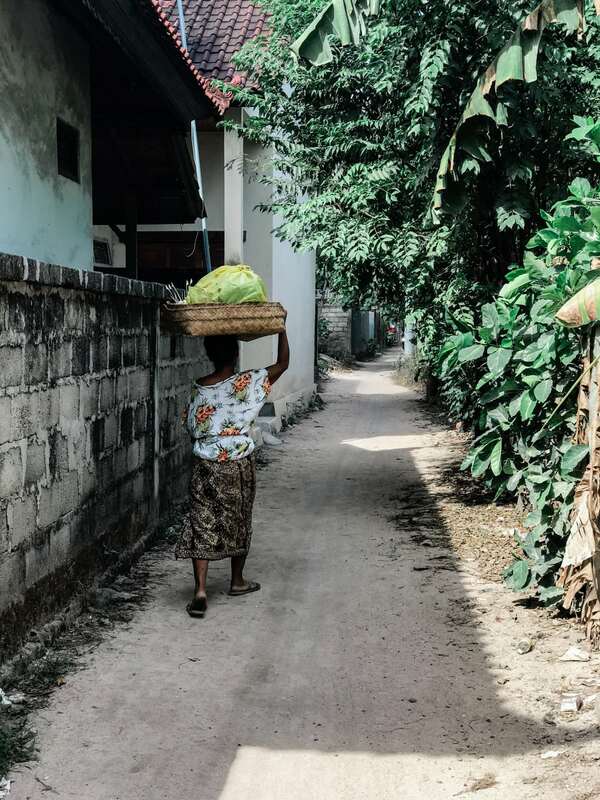 As we were traveling to and from Lembongan, we were asked about the length of our stay on the island. Both times, the individuals looked at us like we were crazy for spending almost a month on this tiny island, especially with Bali being just 30 minutes away. However, even with four weeks, I feel like we just barely scratched the surface of little Lembongan. I loved the food, the people, the beach, the island vibes, and the culture. 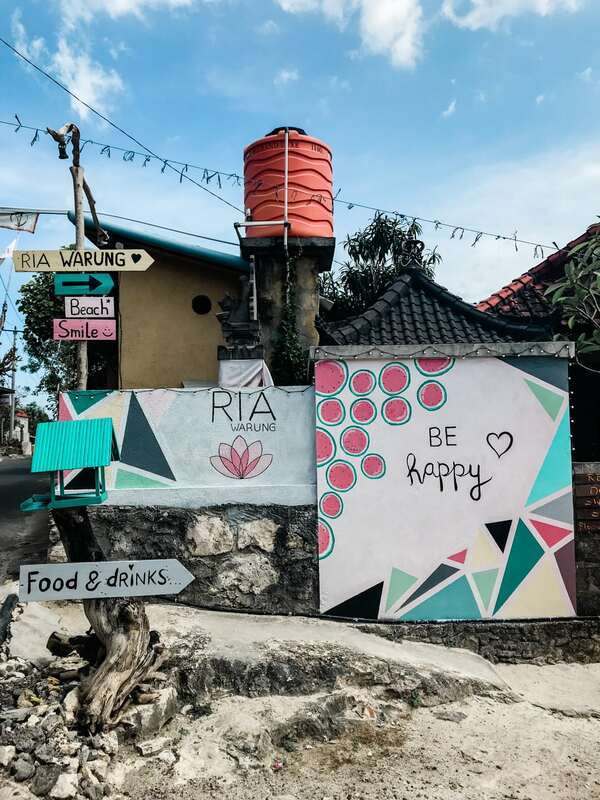 Quirks and all, Lembongan was a fun place to visit and study yoga. It may often get overshadowed by the popularity of Bali, but if you’re in the vicinity, my sister and I recommend checking Lembongan out!